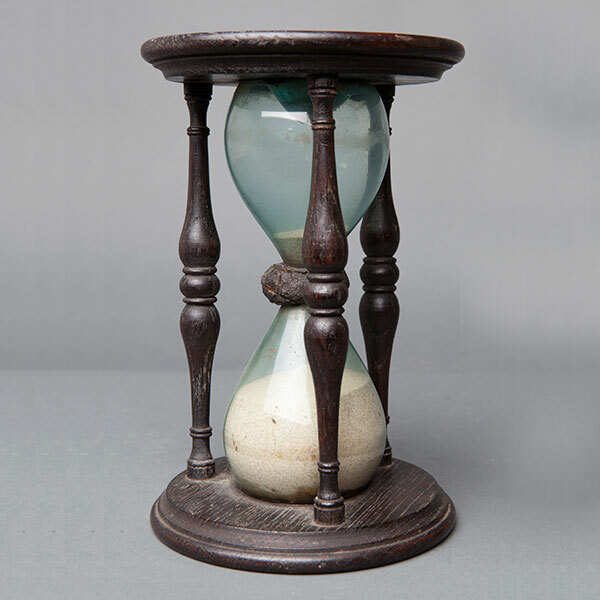 A Georgian mariners hour glass. Made in England circa 1780. The turned oak frame has three baluster supports and molded edge end plates, dished to hold the bulbs. The two green/blue hand blown glass bulbs co-joined with waxed twine. The white sand still flows smoothly taking about one hour. All in excellent sound condition with no damage or repair, glass and frame all tight. A true good example with lots of character. Height 7,7/8″ diameter of ends 5,1/4″. Weight 622 grams.